Harlequin Presents brings you four new titles for one great price! Enjoy glamorous international settings, powerful men and scandalous, seductive romance in these four books! 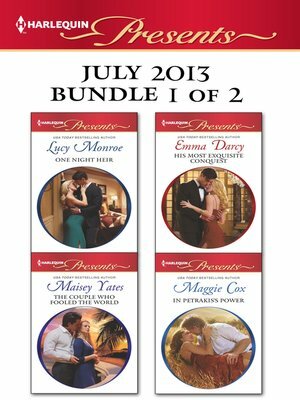 This Harlequin Presents bundles includes One Night Heir by Lucy Monroe, The Couple Who Fooled the World by Maisey Yates, His Most Exquisite Conquest by Emma Darcy and In Petrakis's Power by Maggie Cox. Look for 8 passionate new titles every month from Harlequin Presents!